The Rockefeller Foundation Launches Annual “Innovation Forum” to Explore Challenges Facing the World’s Poor and Vulnerable, July 26, 2011. On June 28, a notification of the Government of Pakistan articulated a plan for completing the process of devolving many subjects, including health, as part of the final stages of implementing the 18th Constitutional Amendment. As a consequence, the Ministry of Health (MoH) was abolished and Pakistan became the first federal country in the world without any central coordination for health. Whilst making this change, those at the decision making helm, however, rightly understood that there are “national” roles in health, which cannot be devolved and retained them at the “federal” level. This notwithstanding, the Commission, charged with the responsibility of implementing the amendment opted for a “cut-and-chop” formula for the MoH, housing various institutions and functions either under the command of seven other divisions—Inter-provincial coordination, Capital Administration and Development, Cabinet, Planning, Economic Affairs, States and Frontiers Affairs, and Federal Bureau of Statistics (FBS)—or merging them with other institutions. Within this context, I will try to be as constructive as possible in this comment in offering a way forward. Let me begin by reiterating my support for the process of devolution, a broader state reform measure, in Pakistan. But let me also emphasize that such bold measures need to be preceded and followed by careful planning with respect to consensus-driven incremental transfer of responsibilities and a concerted focus on building capacity. This places a huge onus of responsibly on those leading the reform process to ensure that the premise enshrined in the process of devolution—provincial empowerment as a means of strengthening the federation and improving governance capability—is actualized. Within this context, five sets of questions need to be considered at this stage as a step towards finding a desirable solution. The first category of questions in centered on “strategic issues”. Where does health leadership reside and who owns health at a time when the most important institutional reform in the history of the country needs to be implemented with significant technical and negotiating skills? 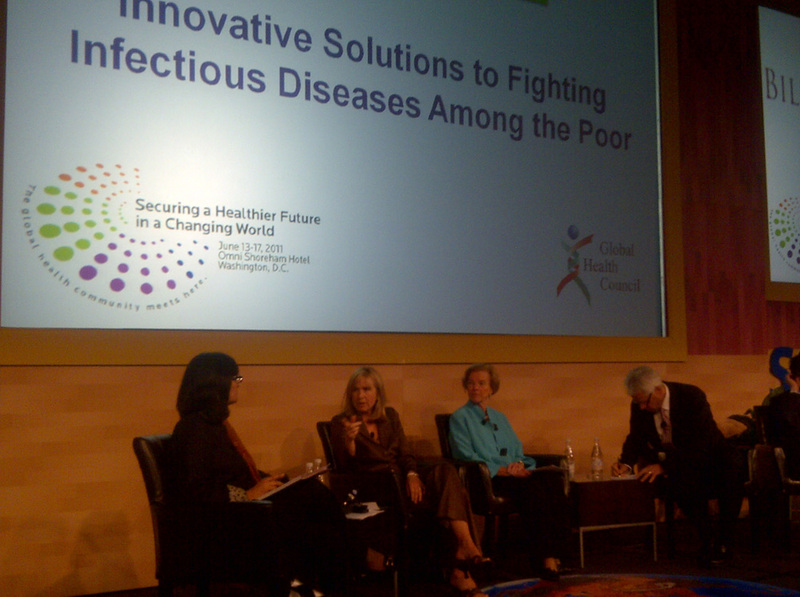 Who will be the national face of health in global health circles in a world, which is getting increasingly globalized? Who will represent Pakistan at the World Health Assembly next year and will that person have the appropriate mandate? At a time when Pakistan risks being the last remaining reservoir of Poliovirus transmission in the world and is jeopardizing worldwide efforts to eradicate a disease for the second time from the face of this planet, we need to accord attention to our international obligations and garner local commitment—there is long list of shortcomings. The second set of questions relate to planning. Are there any plans to assist with this transition? Are development partners on board? Is there any mechanism to coordinate their contributions and those of other stakeholders in developing transitional plans and overseeing their implementation? Here we need to be mindful of a risk—lack of donor coordination can compound fragmentation. The third set of questions is “provincial” in nature. Do provinces have capacity in human resource, planning and financial management and infrastructure terms, to take on these responsibilities? Have we taken into consideration the issue of asymmetry in capacity at the provincial level and possible lack of readiness on their part to take on responsibilities? Are we not inadvertently creating “centralization of power” in the provinces as a result of sudden devolution, sans checks and balances, especially when seen in the context of in-tandem scale back of the local government reform and with no tangible plans to decentralize responsibilities to the districts? What implications does this have in the context of bitter political rivalries between the central government and the largest province? In the fourth place, restructuring at the federal level raises its own questions. What kind of issues can emerge as a result of the cut-and-chop formula? With respect to the eight divisions that are now tasked with responsibilities, which were previously within the MoH’s purview, have considerations related to capacity and mandate been given due consideration? The cut-and-chop formula scored low on a nine-point-based assessment as a possible option for the way forward, post 18th Amendment (page 19, http://heartfile.org/pdf/HEALTH_18AM_FINAL.pdf ). However since the Implementation Commission is averse to the notion of a unified federal institutional structure for any of the devolved subjects, on the perceived notion that this is against the spirit of devolution, we are left with no choice but to offer the next best option. Possible options will be discussed towards the end of this comment. The seven divisions have capacity constraints with respect to taking on additional functions and there are resource implications of creating the needed capacities. For example, the Economic Affairs Division (EAD) has been entrusted with “dealings and agreements with other countries and international organizations …” but beyond negotiating and signing agreements, EAD does not have the apparatus to implement agreements. WHO’s and UNICEF’s agreements are a case in point, which were previously implemented through a structure, which was housed in the international office of the MOH. There are other aspects of international dealings, which are highly technical in nature and involve Pakistan’s international commitments which do not fall in the scope of EAD’s capacities. Other aspects of international dealings have resource and procurement implications. e.g., vaccines need to be procured nationally for sometime, but the structure (the Expanded Program for Immunization) has been devolved, which flags the need for an appropriate transitional arrangement. Devolving these functions is neither cost effective nor in keeping with internationally prevailing trends. Furthermore, institutions like the Global fund and GAVI with potential and approved grants to the tune of billions envisage problems in having to deal with five entities instead of one mechanism and EAD may not fulfill requirements to be their Principal Recipient. We also need to be mindful of a potential reality—in the present global financial crunch, they can find this procedural difficulty as a reason to withdraw. In the regulatory domain, functions have been retained at the federal level. Of the two kinds of regulatory arrangements envisioned, one is modeled on the design of other statuary and autonomous regulatory institutions recently created in Pakistan, which are placed under the oversight of the Cabinet Division without a reporting relationship with the concerned Ministry. The same is envisaged for the proposed Drug Regulatory Authority (DRA), a correct decision in principle. However, insights from past experiences can be instructive, in relation to ambiguity about the policymaking mandate, which can also be a problem for the DRA. These ambiguities have been discussed in these columns on April 30, 2011, and need to be carefully considered in transitional planning. Mandate related issues can also arise in other regulatory agencies—PMDC—which are not strictly “autonomous” and have now been placed under the division of Inter-provincial coordination, which also does not have the technical capacity to engage in this area. The final question: where is the risk of fragmentation most detrimental? The most critical problem is in the area of health information. The Entry “..…extension from one province to the other of infectious…diseases” has been devolved to the provinces, vital health statistics has been given to FBS, emergency preparedness is now under Cabinet, Directorate of Central Health Establishment, under which some aspects of health-related border security fall, is under Planning Division and the agency, which should act as their apex, the National Health Information Resource Center, has been given to the National Institute of Health. Fragmentation is also a concern in the policy arena, some elements of which are truly “national” in character. Fragmenting information and disjoining it from planning and policy simply means that the government is undermining its own mandate and decision-making ability in health. July 19, 2011. The Heartfile Health Financing program, which relies on volunteers to achieve its objective of protecting poor patients against medical impoverishment, has recently honored its star volunteer, Mrs. Naheed Batool—a befitting response to the UN Secretary General’s call on people around the world to carry out volunteer work to mark the 93rd birthday of Nelson Mandela. July 18, 2011: Many lessons can be drawn from the scale-up of HIV services in low-income countries for institutionalizing care for non-communicable diseases (NCDs). Such insights are useful as the international community and domestic policy planners converge during the upcoming UN High Level NCDs Summit this September to draw strategies to address the burgeoning challenge of NCDs. Dr. Sania Nishtar has recently co-authored an article with Miriam Rabkin of Columbia University to draw attention to the potential of such experience sharing. The paper has been published in a special supplement of the Journal of Acquired Immune Deficiency Syndrome, which was released at an event preceding the International AIDS conference in Rome, on July 15, 2011. The article can be downloaded here. July 08, 2011: The US Institute of Peace in collaboration with another Washington based think tank, the Institute of Social Policy and Understanding, held a panel discussion on the captioned subject in Washington on June 14, 2010. 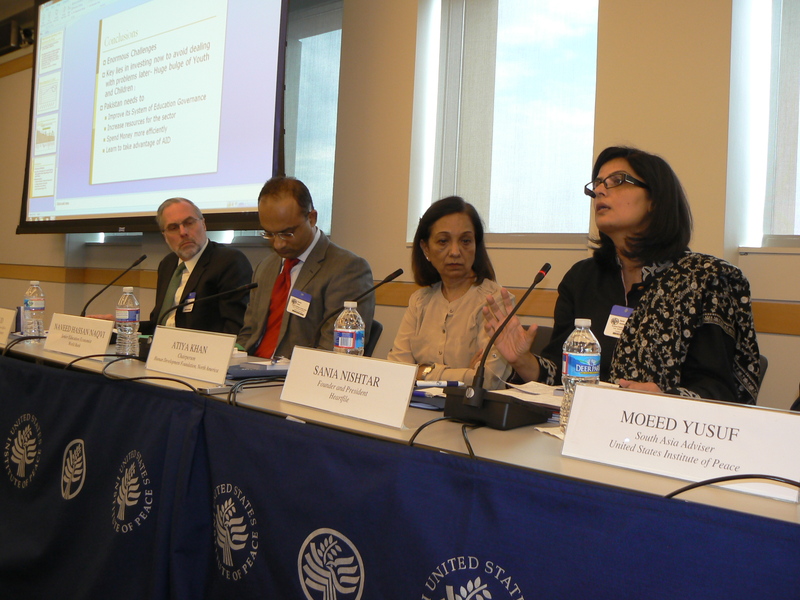 Panelists included Dr. Sania Nishtar, Dr. Attiya Khan, Naveed Hassan Naqvi and Mr. McCloud (USAID). The session was moderated by Moeed Yusuf (USIP).